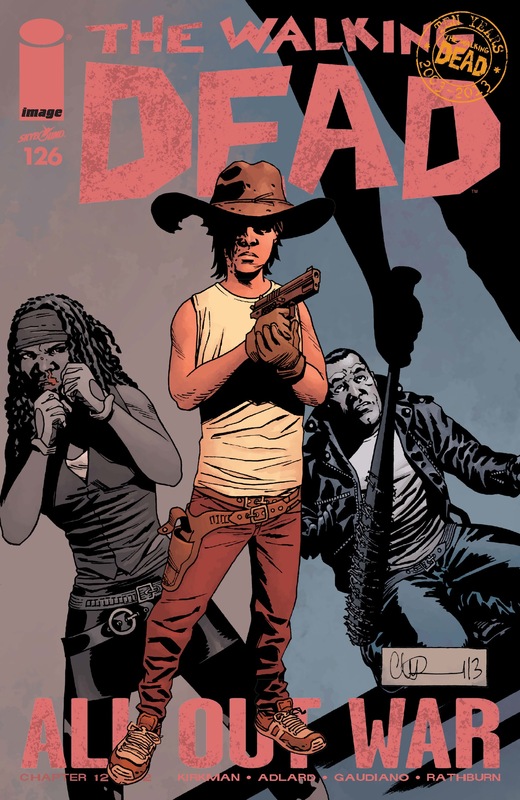 A Look at The Walking Dead #126: “All Out War” Finale | What Else is on Now? The finale to “All Out War” was a mixed bag for me. There are moments for character growth and development, primarily for Rick, Negan’s rule over The Saviors comes to an end and we’re given a bit of hope and optimism for the future after the folks of the Alexandria Safe Zone have endured so much carnage. Where the issue suffers is in its pacing. For a finale that had so much buildup, the ending didn’t really fit all of the anticipation that Robert Kirkman teased from issue to issue. 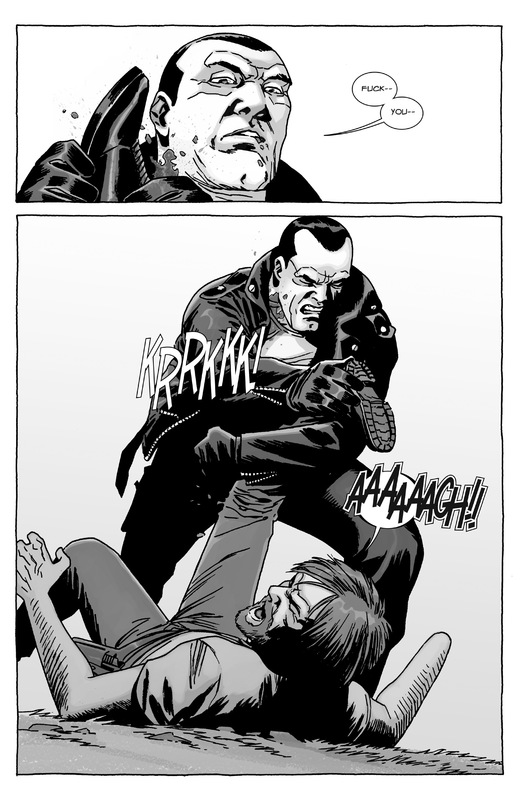 The resolution to the Negan problem is over fairly quickly. 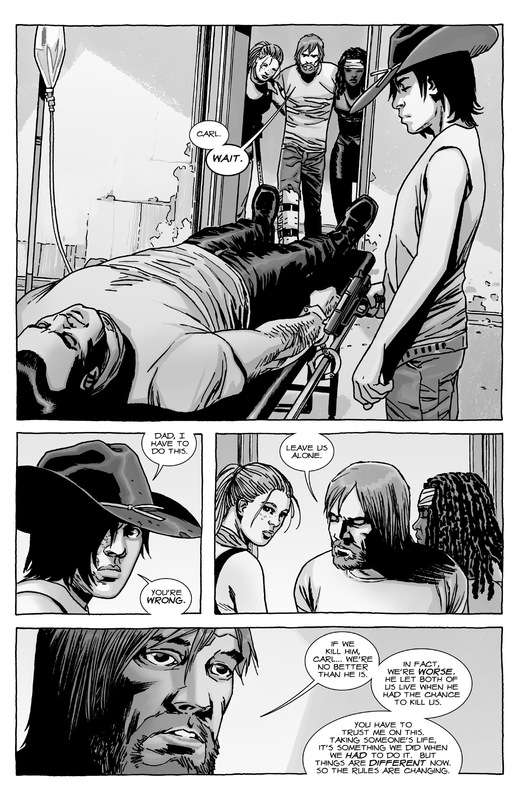 Also, it felt as if the first few pages had to wrap up the ongoing conflict with The Saviors pretty fast in order to spend more time with the Alexandria folks. I’ll start with the smaller moments, first. Rick has had the burden of leadership saddled upon him. He has to be the one to make the decisions that no one else, except for maybe Carl, wants to make. 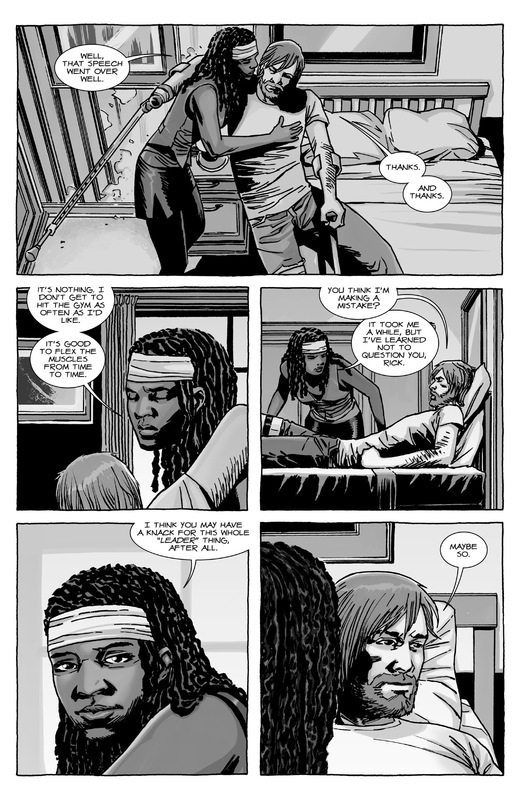 When Michonne tells Rick that she’s learned not to question him and believes he has a knack for leadership, it shows that while people may not agree with Rick’s decisions, they ultimately believe he’s making the right ones. As he did with Andrea, Rick showing optimism in the face of so much danger shows that he truly believes that something good can come out of all the bloodshed the folks have dealt with at the hands of The Saviors. And yet Rick, as designated leader, doesn’t really take much blame for anything that’s happened under his watch. 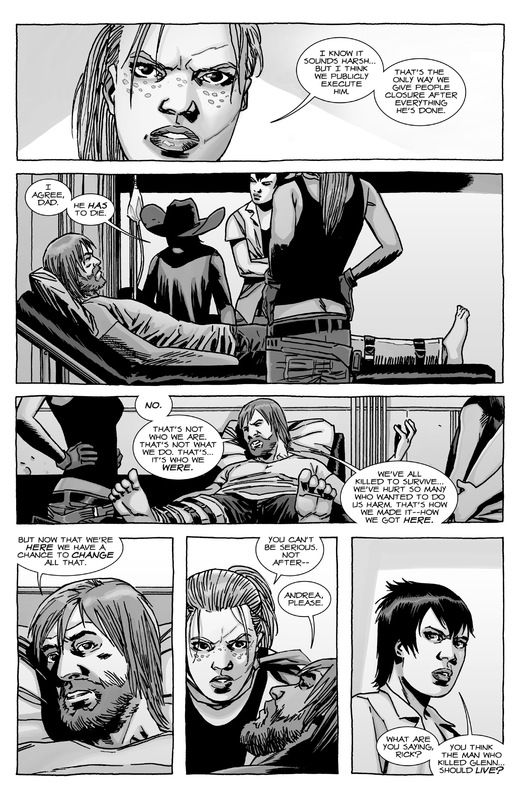 From what I remember, the last time we saw someone take out their anger on Rick for his decisions was Maggie punching him over and over for not stopping Negan after the events of issue #100. And here we have that terrible moment referenced when Maggie asks if it’s wise to let Negan live, considering, you know, he beat Glenn to death with a baseball bat. But Rick believes that they are ultimately better than Negan because they have a chance to make something out of the world they live in. This is what they’ve wanted since arriving in Alexandria, but Negan’s presence put a stop to that. Now that he’s not a threat, Rick doesn’t think there’s a need to kill him because that would make them no different than him. Had this been the Rick we were with back at the prison, I doubt he’d be as forgiving. Andrea and Carl certainly aren’t. Heck, Rick wanted to have Thomas hanged back during the prison arc and now Andrea would prefer that Negan is publicly executed. And Carl was ready to pull the trigger himself. Sure, Negan let Rick live, but, as he pointed out, he did it because Rick was the leader. He wanted Rick to suffer by watching everything he’d worked for crumble all around him. It’s the reason Negan didn’t kill Rick, but made him watch Glenn be killed before his eyes. The rules in the zombie apocalypse world constantly change and that’s reflected in Rick’s decision to let Negan live and see the folks of Alexandria prosper. Even after the loss of one of his best friends, losing both his wife and daughter, his son losing a chunk of his face, after everything that he’s been through, Rick still believes there’s a world worth fighting for. I’m sure Carl does, as well, but his bloodlust, I doubt he’ll be as open to the idea of a brand new world where justice is served instead of vengeance. 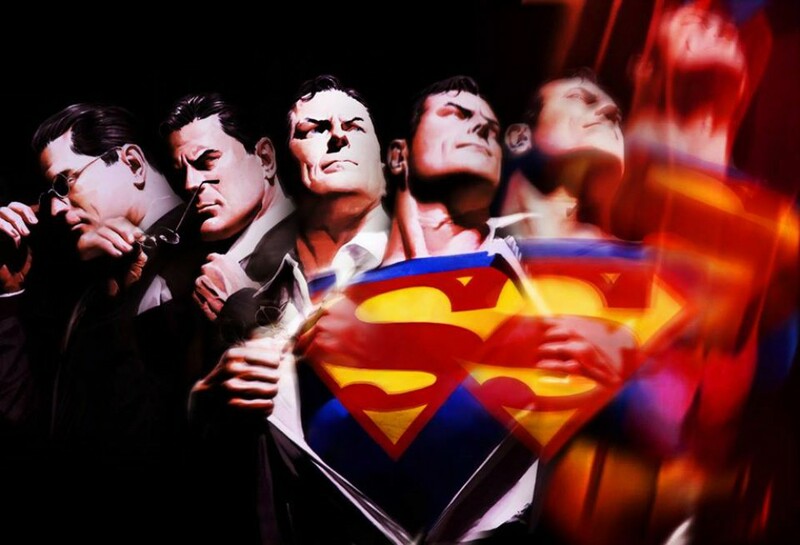 After all, vengeance can change a person. As with the show, Rick and Carl are fighting to save their own humanity and steer off the dark path. As for Dwight and The Saviors, it was clear that he’d try and usurp power from Negan. He did still do his part and help Rick and the others bring Negan down and he, like Rick, wants an end to all of the fighting. Whether The Saviors choose to follow him is another thing, but if so, maybe there can finally be some peace between the two groups. So let’s wrap things up with Negan. The man is a bonafide fighter. Despite having his neck slashed with a blade, he continued to fight until he couldn’t go on any longer, even going as far as breaking Rick’s leg. It was a bit suspect that he was suddenly so open to Rick’s idea of an alliance, and no surprise, it ended up being a ruse. 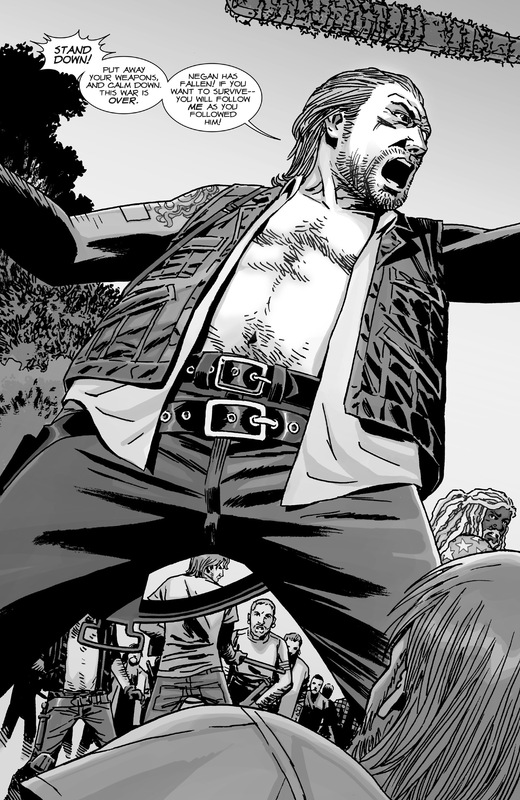 Now that he’s out of commission for the time being, it will be interesting to see Negan adjust to life without power or an army. He probably wishes Rick would have just killed him, rather than keep him alive. Like I said, the finale to this arc was mixed. It didn’t need a giant, bloody shootout like we got when The Governor destroyed the prison, but it felt as if we moved through this issue a bit too quickly. However, despite that, there’s a genuine sense of optimism and hope for the future that we see in Rick’s speech to the people of Alexandria. Some would say that killing Negan would have been justice for Glenn, but Rick prefers that Negan watch the citizens of Alexandria prosper. Killing Negan would let him off easy and be too predictable for this series. Like Negan letting Rick live, Rick wants Negan to see that all his efforts to terrorize were all for naught. With so much chaos throughout this arc, maybe now the group will have a chance to rebuild.